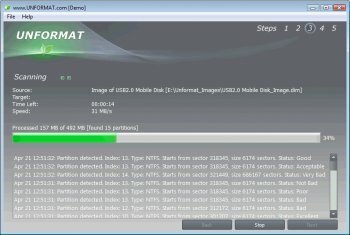 UNFORMAT is a data recovery software from LSoft Technologies. This utility is ideal for anyone, regardless of their level of experience with data recovery, who needs to unformat hard drive partitions or any other kind of digital storage media which has been accidentally formatted or damaged due to a logical drive failure. It can recover individual files, deleted or damaged partitions and formatted disks or partitions by exploiting the fact that deleted data is not actually permanently deleted until it has been overwritten by another file copy or creation process. The software supports all file systems which are natively supported by Microsoft Windows, Apple Macintosh or Linux-based operating systems. The latest edition adds support for more than thirty additional file signatures, and it includes a straightforward script editor which allows advanced users to create custom file signatures for rarer files types.